MARTIN FLETCHER is one of the most highly respected television news correspondents in the world. He is also rapidly gaining an equally impressive reputation as a writer. 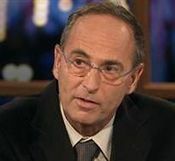 He has won many awards including the National Jewish Book Award, a Columbia University DuPont Award, several Overseas Press Club Awards, and five Emmys. He spent many years as the NBC News Bureau Chief in Tel Aviv, and he is currently based in Israel, Mexico, and New York. He is a Special Correspondent for NBC News and PBS.